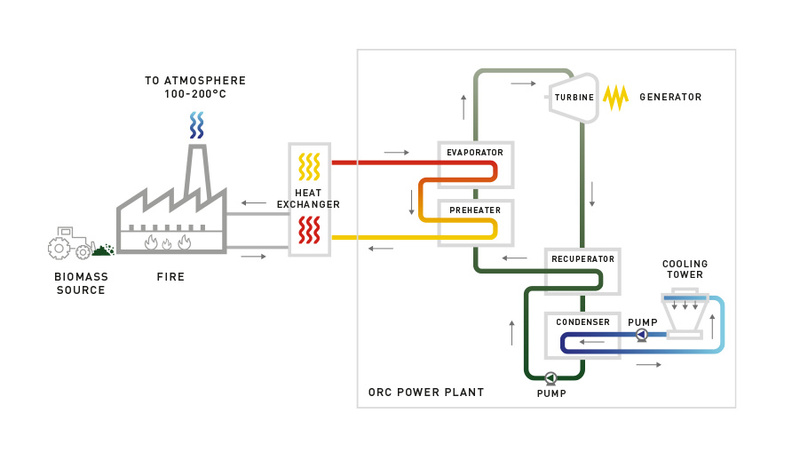 In small biomass plants, ORC technology is the ideal choice due to its high efficiency, availability and ability to follow load dependent on fuel supply. In addition, the elimination of the steam turbine for traditional biomass solutions brings with it a number of maintenance and operational advantages. A biomass power plant utilizes waste organic matters from industrial processing to produce electricity, eliminating the issue and the costs of waste disposal. Biomass power plants generate electricity from waste organic resources replacing purchased energy, thereby reducing energy costs. Reduced energy costs and waste disposal also contributes to reducing operating costs. Biomass power plants produce electricity that can directly be employed to power industrial processes or residential needs representing an easier and more reliable access to electricity for those remote or isolated sites with difficult access to the grid. Biomass plants can produce both electricity and thermal power for heating purposes thus performing two tasks and becoming a very profitable solution for your business. Biomass power plants utilizing secondary or tertiary waste biomass for power production substitute the use of fossil fuels and thus reduce SOx, NOx and CO2 emissions as well as the amount of waste in landfills. The biomass feed of the boiler that can be exploited as "fuel" includes for example wood industry leftovers, olive waste or other secondary biomass. The boiler, via the combustion process, converts the biomass in thermal power to feed the ORC module. The hot exhaust gas warms up the intermediate fluid in a heat exchanger. The ORC-boiler interface circuit transfers the thermal power from the boiler to the ORC evaporator. The commonly employed intermediate fluids between the boiler and ORC are thermal oil, pressurized water or steam. The interface fluid transfers heat to the organic fluid in the ORC evaporator, where the organic fluid vaporizes. The vaporized fluid then passes to the turbine. Here the vapour expands causing the turbine to spin and create electricity into the generator. The client Energia Vulture Alto Bradano, had two requirements when they partnered with EXERGY. Their first requirement was to dispose of waste from grape and olive production and waste from the local wood processing industry using environmentally friendly methods. Their second requirement was to operate their business in a more economically efficient way and develop a secondary revenue stream by selling electricity back to the gird. EXERGY provided a packaged ORC unit which when combined with a thermal oil boiler would efficiently convert the agricultural waste into electricity. The ORC unit has an automated control system, ensuring minimal staff monitoring, thus making the operation simple to manage for the client. The unit integrated well into the surrounding environment and met with the appropriate emission requirements, The unit was air cooled and due to the inclusion of the EXERGY Radial Outflow Turbine it operated at an extremely high efficiency level (up to 24%) compared with similar installations on the market.